We collected the fabric, we picked the teams, we set up in the gym. We were ready to rumble. 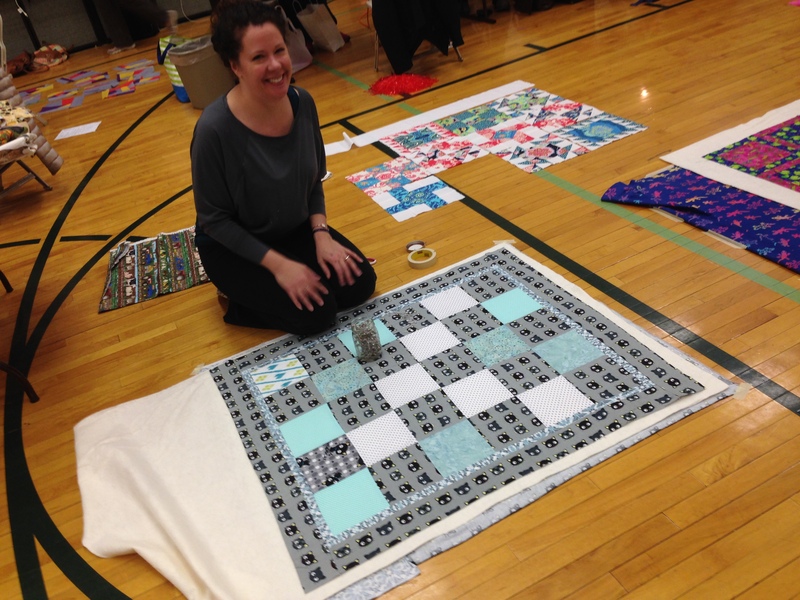 March Madness was a fun and frantic day of charity sewing, the best possible way we could have kicked off our guild-wide charity quilting program. 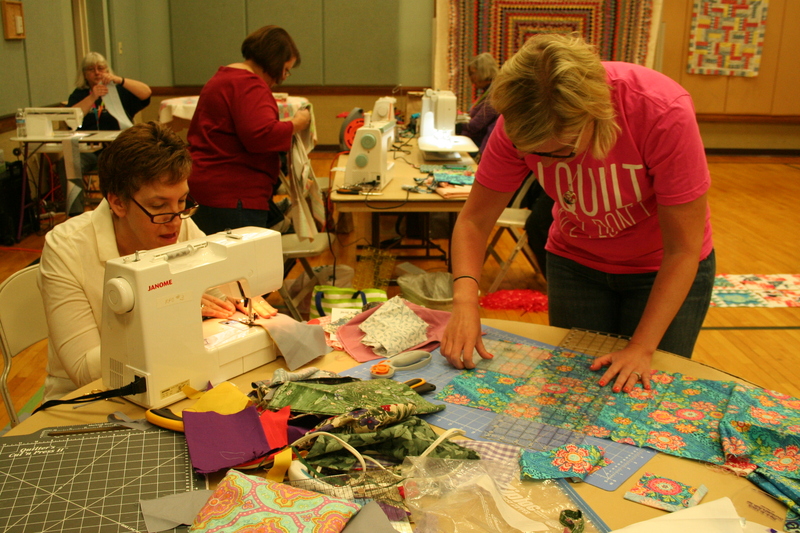 We had more than 20 quilters sewing throughout the day using the mountains of fabric donated by our generous members and led by team captains Ashley (Red team) and Beth (Yellow team). As everyone sewed, referee Stella yelled out points like a Hogwart’s professor. There was pizza for lunch and a great spread of snacks. And then there were the quilts. 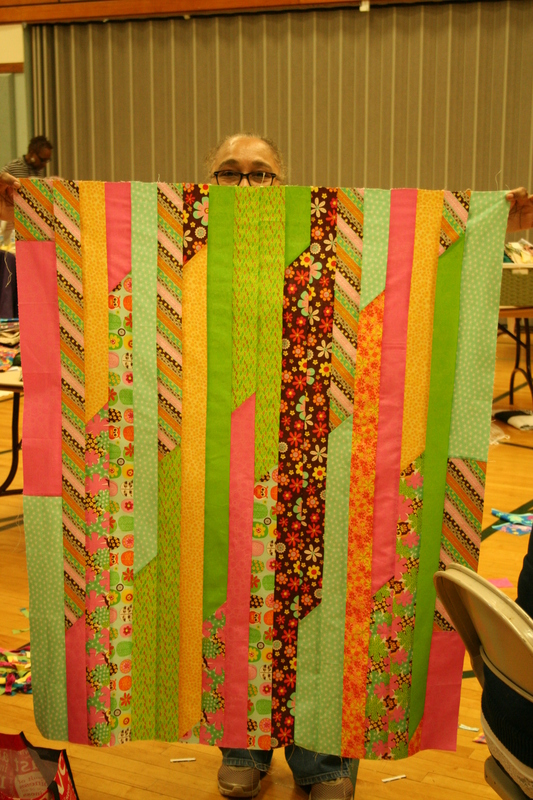 Fifteen tops in all, four basted sandwiches and 5 completed quilts (plus one that Tracy finished on Sunday night)! 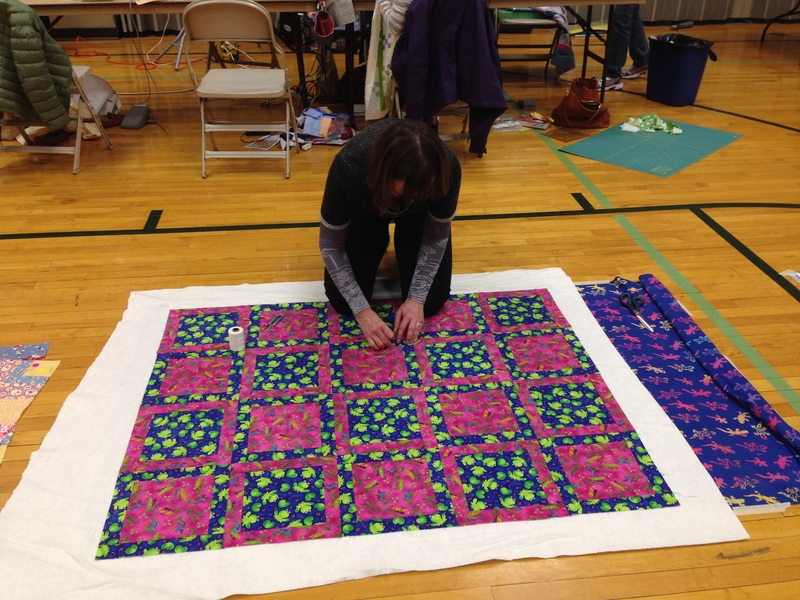 Though the Yellow team pulled out a decisive win, we were all winners, along with the people from Shelter our Sisters and Quilts for Kids who will eventually receive these beautiful quilts. 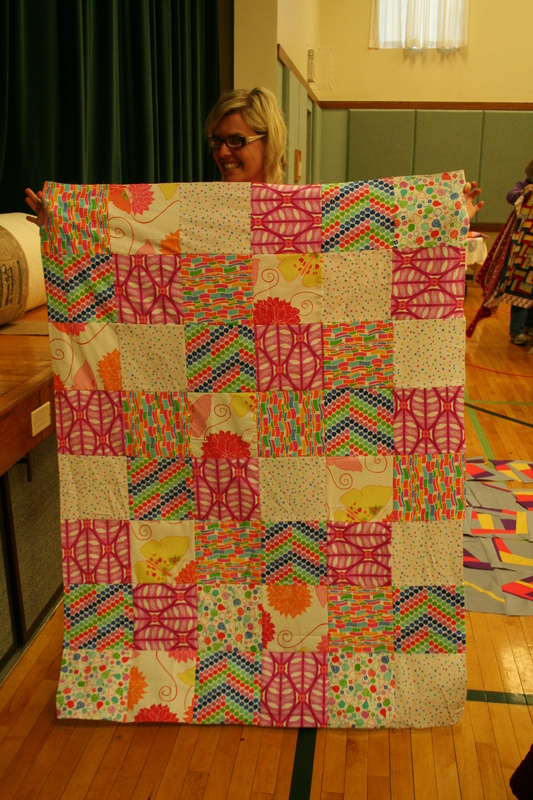 HUGE thanks to Stephanie and all of the kind people at the LDS church, to Ashley and Beth for their leadership and spirit, to all our quilters and donors, to Caroline for bringing much-needed afternoon snacks and to everyone who sent moral support. But I save the biggest thanks for our new VP Stella, who stuffed goody bags, provided tunes, baked goods, served as score keeper and referee, ordered pizzas and won overall event MVP. Heat oven to 350°F. Lightly grease bundt pan with shortening or cooking spray. In shallow bowl, mix sugar and cinnamon. Separate dough into 16 biscuits; cut each into quarters. Roll in cinnamon sugar to coat. Arrange in pan, adding walnuts among the biscuit pieces. In small bowl, mix brown sugar and melted butter; pour over biscuit pieces. Bake 28 to 32 minutes or until golden brown and no longer doughy in center. Cool in pan 10 minutes. Turn upside down onto serving plate. Try to share. Optional Mix-ins: chocolate chips, toffee bits, other nuts like almond slivers or pecans, cranberries, raisins – use your imagination! But WAIT! Our jobs are not done yet. 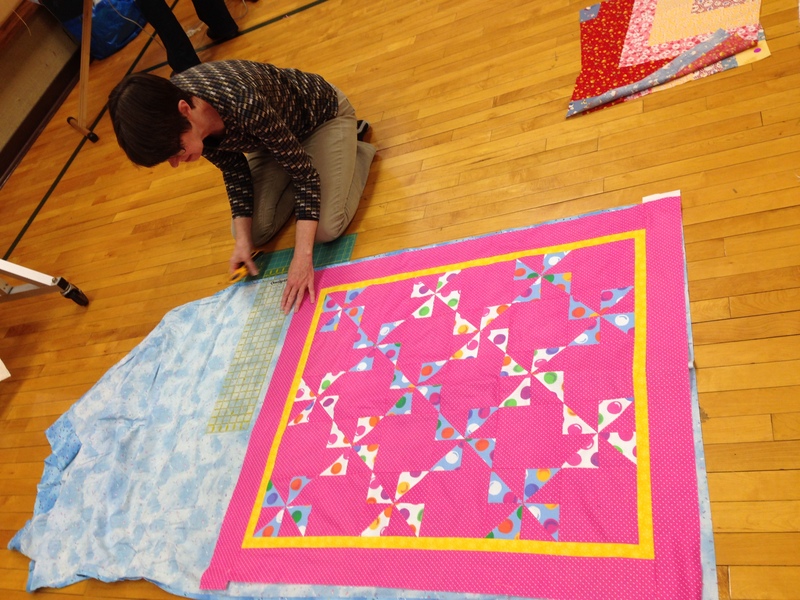 We still have to finish these quilts! 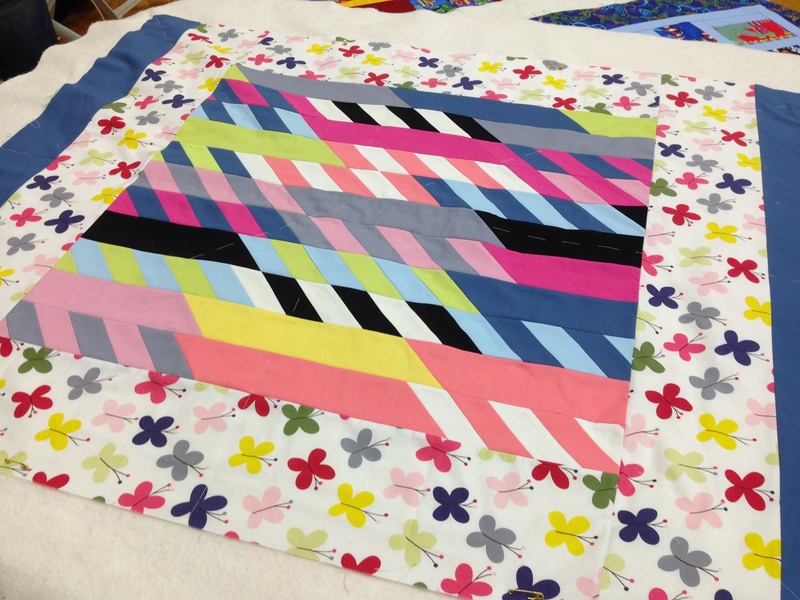 If you’d like to chip in with quilting or binding (or if you’ve been looking for a chance to practice on a real quilt), please email or leave a comment. 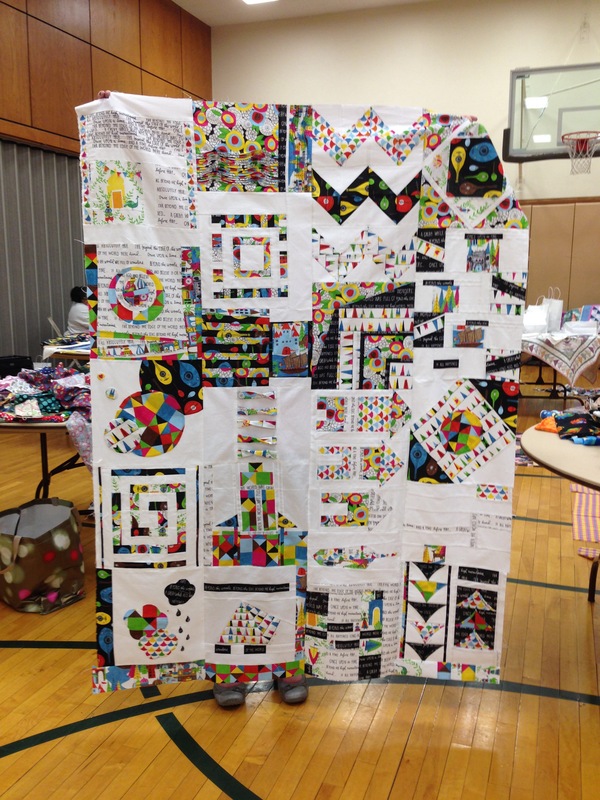 This was an amazing kick off, so let’s keep our charitable quilting momentum going. We’ll be sure to plan another Madness event by the fall at the latest, but we’d love for everyone to take part. We’ll bring tops and sandwiches to the April meeting on the 17th. And the frosting on the Monkey Bread is that we were interviewed! 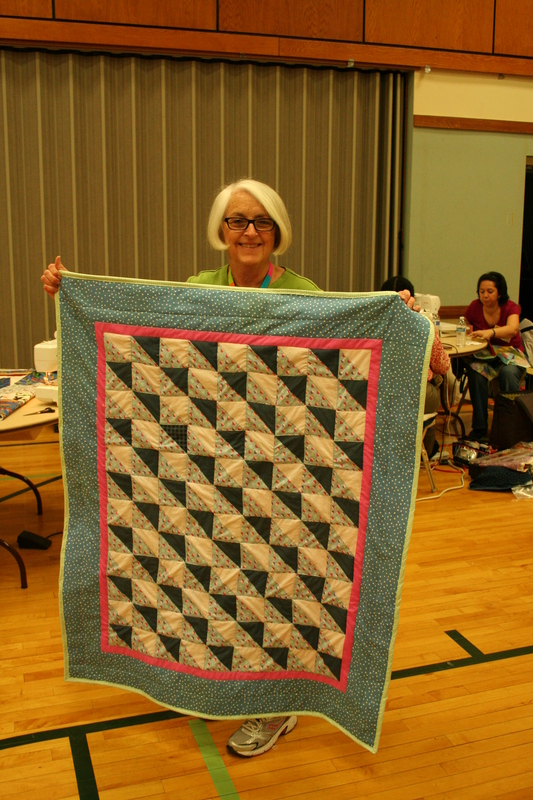 One of Stephanie’s fellow parishioners and the public affairs director for the church works for All American Crafts, the company behind Quilt Trends Magazine and The Quilter. We’ll see if anything comes of it, but for now we are just so proud of what we can do when we come together, and we can’t wait to get together to sew again. It was such a blast! I can’t wait to do it again! Kathy- we were so happy you joined us! Thanks for all of your hard work! Hi Anne! 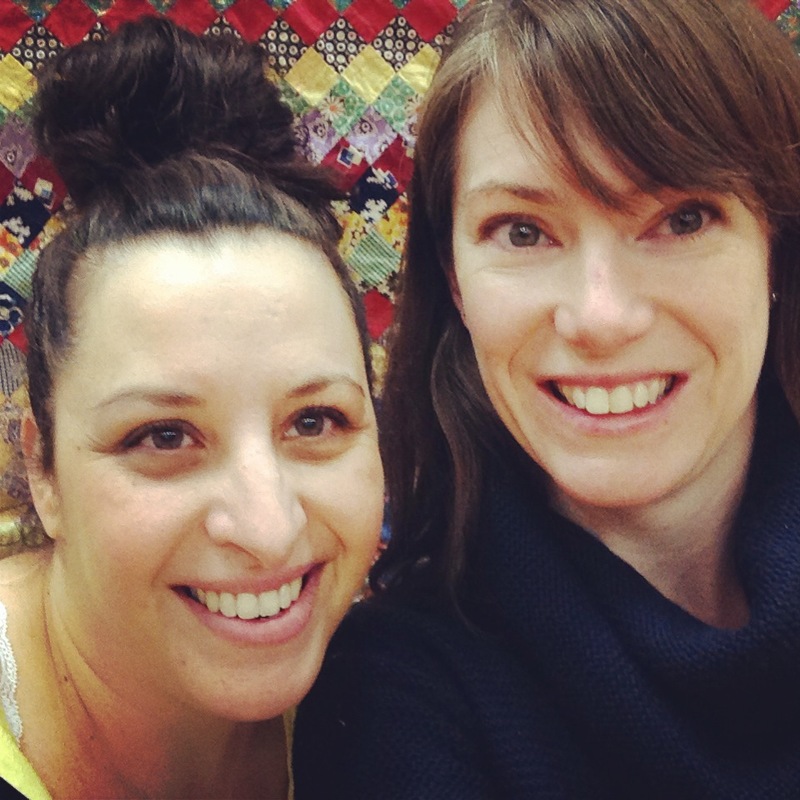 We would LOVE for you to quilt and bind one of the charity quilts! 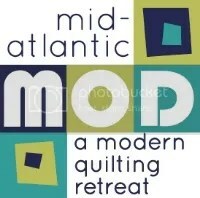 If you will be at the April guild meeting we’ll make sure you get a quilt! 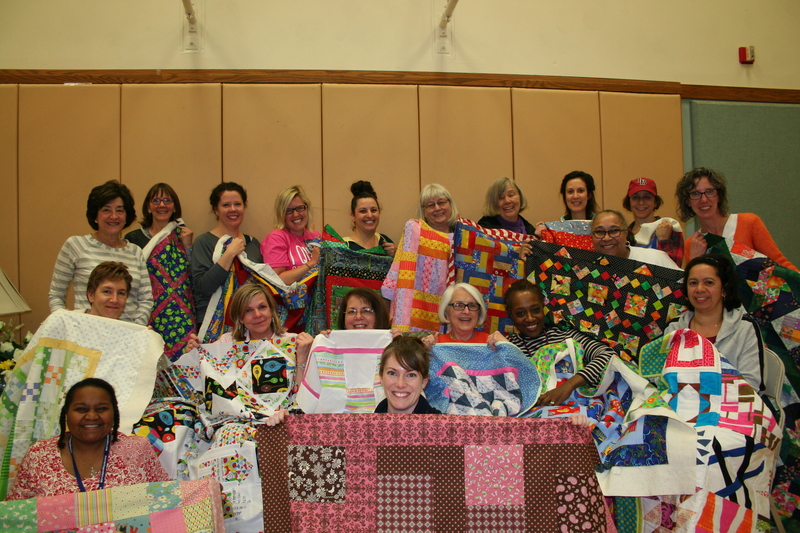 Congrats, what a lot of lovely quilts! I’d be happy to bind one of them and hope to participate the next time. Hi Caroline! Thanks for your offer to bind a quilt. We will DEFINITELY take you up on that! Keep an eye on this space and we’ll put the call out!